The moments when I felt alive were then I was just a little kid, amazing things happened and I was happy. I had friends and family that were all together and it was a sick life to have. But everything comes to an end as you get pushed to things you don’t want to do that makes you feel uncomfortable. And you get pushed and pushed and then you break, and so do your friends. And they leave you and pick on you and laugh at you for not being able to talk to the girl you like. And I did just that, just so scared and not willing to talk to girls or mostly the girl I liked. And I lost all my friends in elementary school for just not being able to talk to a girl who I find really stupid now. So anyway days go by, weeks, months, grade level after grade level and I never spoke a word. Because if I did then people would hate me for it (what my brain thought at the time). And ohhh middle school how wonderful and joyful it was… not really it was depressing and thus came him, a black figure that looks kinda like me intimidateing me like it wanted to focus on me and me only, it sounds weird but it was true I saw him and I was freaking out and it spoke to me. Telling me to stay away and be alone, even if I talked to other people it yelled in my ears screaming “STAY AWAY!” “GO AWAY!” and it freaked me out and I just obeyed what else was I am going to do? It got worse and worse as it became physical with me, as it sank my heart inside my chest and it gave me some anxiety attacks as I breathed heavily my mind racing and all I could see was a dark shadow of myself standing over me watching me smiling at me, he wanted one thing from me, To die. I had never friends in high school but the one thing I did have been a girlfriend, and boy was she hot. That’s also what depression wanted. Girls, and she had depression too and it helped mine because I was trying to help hers and it was the best feeling till. We went to far, and we had s*x and that’s all she ever wanted from me and we got caught and I never seen her again. Girls and girls later high school started and I thought to myself this is it, this is where ill get lots of friends and possibly a girlfriend. Nope, I mostly sat alone as my depression yelled at me most of the time and it hurt. Every night it would give me anxiety attacks and or I mostly cry myself to sleep (seriously it’s not fun). And my depression had to take one step farther as to shift into a back figure that was my first girlfriend and speak in her voice “WORTHLESS!” “DIDN’T EVEN MEAN ANYTHING TO ME!” and it sunk me down low and lower till I went insane. As my anxiety grew I couldn’t control it as it swarm over me like a flood engulfing my room and myself as well. My heart pounding and my head spinning my vision getting blurry it felt like I was dying inside. This happened for a week or so then slowly stopped but that didn’t stop depression from ruining my life. The middle of the school year I finally found a frond a friend and this friend will be known as Will (for personal purposes). Will was everything and he helps so much by being by my side through and through he always had my back and I’ll always have his. He introduced me to new friends and it became a group and it was amazing, but my depression pushed them away and that’s when I got mostly pissed off and it affected my friendship as well. 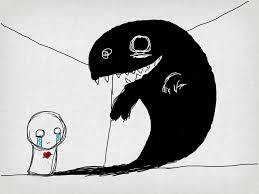 This black figure was taking my life away and tarring me apart. And to make things worse in the middle of sophomore year Will was getting abused by his dad and wanted to move to his moms out of the city where he wouldn’t be at our school and wouldn’t even be around the group anymore he would be hundreds of miles away and no one can say or do anything about it. So after a few days without Will the group fell apart, no more movie Fridays no one talks to one another it just all falls… apart. Depression just new how to push me and blamed me for everything and it worked every time. After years of torture and pain I decided to take pills for my depression as I never knew my parent’s life as I never knew them so I did and the group is still broken slowly repairing itself very slowly. Will is nowhere to be found not even in texts well, sometimes but once in a full moon. And depression well, it can get to anyone and it can cause hell and I haven’t seen it for a while. But if you see a dark figure… Run. Umm… “tarring”? “Threw”? This should have been checked before published. You should of changed a few things. First off the title. You say “facing myself” yet in the story you call it depression.You should rename it to “Facing Him” as it gives a mysterous effect to the reader at first glance. Second dont call him depresssion. Make it a small little mystery on what this entity is. Second. Fix your spelling mistakes. Overall this is a good story and I hope you succeed to defeat depression once and for all! Barely readable with all the mistakes. I agree with Anya. You lose the heart of what you are trying to say because the reader has to struggle so hard to understand the actual words and sentences. I am sure you have a fine comment to make on depression, but you must get your pieces edited, please. Sorry guys if my spelling is off i was really tired when i was making this and im fixing them right now and also reading what you think should be best for the story please comment anything you think would make this story amazing or if you want ill make a more detailed story dealing with this back figure!